Tag line: "The third dimension is terror"
The original Jaws is a classic, and one of the most thrilling (not to mention memorable) films of all time. Jaws 2 was a step in the wrong direction, but still had its moments, and stayed with me because of my initial experience watching it (for more on that, just click the link). 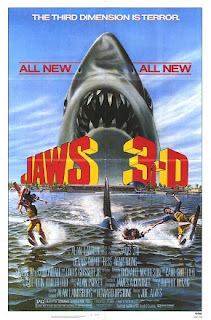 When Jaws 3 was released in the summer of 1983, my friends and I were one of the first in line to see it (even after the horrible time we had with the 3-D in Spacehunter: Adventures in the Forbidden Zone, we decided to give the gimmick another chance). Yet, unlike Jaws and Jaws 2, I remembered absolutely nothing about Jaws 3, and as I sat down to watch it today, I felt as if I was seeing it for the first time. Of course, once the movie was over, I realized why it didn’t leave much of an impression. It’s been years since the last shark attack on Amity Island (who knows how many years), and Chief Brody’s boys are all grown up now. Mike (Dennis Quaid) works as an engineer for SeaWorld, an oceanic amusement park owned by eccentric millionaire Calvin Bouchard (Louis Gossett Jr.); and is dating marine biologist Kay Morgan (Bess Armstrong). Mike’s younger brother, Sean (John Putch), is a college student, and has flown in to visit Mike and Kay just as the park is preparing for its grand opening. His first night in town, Sean meets Kelly Ann (Lea Thompson, in her screen debut), a water skier / acrobat, and the two strike up a relationship. Also on-hand for the big event is world traveler and big-game hunter Philip FitzRoyce (Simon MacCorkindale), who, along with his valet Jack Tate (P.H. Moriarty), is a special guest of Calvin Bouchard’s. Another “guest” has also turned up for the grand opening: a great white shark! After feasting on a park employee and a pair of nighttime coral poachers, the shark sneaks up and surprises Mike and Kay while they're scuba diving near the Spanish Galleon exhibit. The two frightened employees attempt to warn their boss, Bouchard, of the danger, but only manage to excite FitzRoyce, who is dying for a chance to hunt a great white. After some debate, it’s decided to capture the shark instead of killing it, and make it part of the SeaWorld exhibit. Luckily, Mike, Kay and the others do, indeed, tranquilize the great white, and before long it is swimming freely in one of the park’s indoor pools. But is the danger truly over? Jaws 3 wasn’t a total disappointment. I enjoyed both the setup and the story (having it take place at an amusement park was a nice touch), and the characters were appealing; Quaid and Armstrong are convincing as lovers, and Lea Thompson is bubbly and adorable as the younger brother’s main squeeze. My favorite performance, however, was delivered by Lou Gossett Jr., the greedy tycoon whose decisions are influenced more by his bank account than they are common sense (wouldn’t be a Jaws movie without one of those characters, would it?) I also liked the twist that occurs towards the end, just when you think it’s safe for everyone to go back in … well, you know the rest. Still, despite its better aspects, Jaws 3 is a pretty feeble flick, and one of the things I disliked most about it was the way it handled the 3-D (surprise, surprise). Now, I didn’t see it in 3-D this time around, but every few minutes or so the camera would close in on something (a piece of underwater coral, a severed limb, etc) that, for the original audience, would have looked like it was poking through the screen. It was yet another lame ‘80s 3-D fiasco, and like most films that utilized it back then, the effect was cheesy as hell (it actually became comical). Worse than this, though, is the movie’s lack of tension; director Alves never develops a rhythm, and those scenes that are supposed to be frightening fall flat. And the less said about the finale, the better (the last 15 minutes or so are unbelievably ridiculous). If there was a plus side to Jaws 3, it’s that it scared me away from the 4th film. To this day, I have never seen 1987’s Jaws: The Revenge all the way through, and from what I hear it’s the worst of the bunch. After watching this movie, though, that’s hard to believe. lol Jaws 4 is so bad it makes Jaws 1-3 look like the Godfather Trilogy. Dave, For all the same reasons I too refuse the watch "Jaws:The Revenge" AKA: #Jaws4. But I heard this great quote from #MichaelCaine he said 'I've never seen Jaws 4 I heard it was a bad movie but I can show the house that I got! 'Kinda sums it all up for me! Great soundtrack though! Rivals John Williams (but never overtakes it). Agree it was a turn down from some of the Jaws 2 integrity but goes just far enough into silly to make it re-watchable for me. There are a couple interesting story moments (the "Gorgo" inspired plot) including a couple creepy beats like a couple opening kills but the finale' with the Harryhausen inspired effects even back when I saw it as a kid, just stick out.